In the September 28, 2017 issue of the New York Review of Books, Fintan O’Toole explained Brexit as the consequence of a rebirth of English nationalism: “Brexit is a peaceful revolution but it is unmistakably a nationalist revolt. It is England’s insurrection against … the belief that contemporary nationality must be fluid, open, and many-layered.” To him, the gradual creation of the UK, led to a Britishness that amplified Englishness without threatening it; the EU integration did, hence the backlash. Yet, by the first decades of the nineteenth century, Empire 2.0 was already giving Englishness a global scope, while simultaneously undermining its hegemonic grasp of ‘Britishness.’ As my post will argue, whiteness has always been part of the story. The second British Empire rebuilt after the loss of the thirteen American colonies was perforce a more multicultural venture than the first, as it encompassed large non-white, non-English swaths of the globe. Crown and Empire became repositories of the British constitution on a transatlantic scale. British paradigms of belonging gravitated towards a civic, rather than ethnic model, which allowed the Scots, the Welsh, and the Irish to reap the privileges of Britishness civility outside Britain. These shifts occurred at a time when new scientific ideas about race brought whiteness and citizenship in direct relationship to one another; Britishness became caught in a settler-colonial racial dilemma further complicated by the existence of the United States. To be British across the globe implied whiteness, even though British criticism of the U.S. targeted precisely its racial policies. Literature played an important role in introducing new ideas and representations about Empire and its Others into the national imaginary. British North America was not the Empire’s most valuable possession but it acquired a symbolic value: it proved that the creation of the United States did not end Britain’s hold on the continent. Canadian Native-settler policies allowed the British to claim the moral upper hand over the U.S. when it came to race relations. Equally importantly, the survival of these loyal colonies right next door to the world’s most prominent experiment in republicanism was a hopeful message about the relevance of the British monarchy in the new political era of national self-determination. Colonial literature was part and parcel of this politically dynamic Atlantic world united by language and trade, but divided by ideologies. Early American nationalism had coincided with Romanticism and built on the Romantic belief in the natural connections between land and the people. Unlike their U.S. counterparts, nineteenth-century writers in British North America did not engage in such a sustained ideological nation-building; they produced instead a body of literature that reasserted the Britishness of the colonial space, coding American political and social arrangements as the negative civic pole against which to test Canada’s Britishness. Both bodies of literature struggled with their representation of the Natives and their place in the national narrative. One example of the literary manifestation of this multi-layered, multicultural understanding of imperial identity and its uneasy relationship with race is the work of John Richardson (1796-1852). Richardson, the first Canadian-born writer of international renown, was part-Ottawa through his mother and part-Scottish through his father; he fought against the American troops alongside Tecumseh in the War of 1812, and was taken prisoner of war for a year in Kentucky. Upon his release, he joined the British Army and spent the next twenty-three years sailing the seas of the Empire. After a brief stint in the West Indies, Richardson lived for the next decade in London and Paris. Around 1826, he started to publish, capitalizing on the new appetite for North American frontier tales. He first attained recognition in London with his Canadian novel Wacousta (1832), which glamorized and mythologized North America’s pre-Revolutionary past. Richardson returned to Upper Canada in 1838 as a journalist for the Times, and remained there for eight years before moving to the United States. During his time in Canada, he published the sequel to Wacousta, The Canadian Brothers (1840), intended to simultaneously fan the flames of Canadian nationalism and of British loyalism by casting the United States as quintessential Other to the colonies. Richardson adapted James Fenimore Cooper’s frontier format to the ideological needs of his time. Whether dealing with eighteenth-century Indian-British conflicts, like in Wacousta, or with American-British struggles in the War of 1812 in its sequel, Richardson creates a usable past for the colonies that prefigures the political divides of the mid-nineteenth century. Wacousta is inspired by the 1763-1766 Pontiac rebellion; yet the eponymous Wacousta is a European in disguise who, in search of personal revenge, incites Pontiac to take arms against the British. Frontier violence comes from Europe, not North America; when Wacousta’s ruses are eventually exposed, Natives and Britons cooperate, and peace is restored to the frontier. In the book’s sequel, Richardson replaces the racial divisions with national ones; the descendants of the impulsive and amoral Wacousta are American, while those of the cool and duty-bound British colonel are Canadian. Tecumseh and his warriors fight and die alongside French-Canadians, English-Canadians, and British officers, and are respected by all. The danger of succumbing to the American political model is dramatized by the dire consequences of the infatuation of one of the two Canadian brothers with a beautiful and ruthless American woman—Wacousta’s descendant—a love that leads to desertion, betrayal, and ultimately death for all involved. The ideological slant was such, that, when he released The Canadian Brothers for the American market in 1851, Richardson had to thoroughly bowdlerize the text; he changed the title to the more neutral Matilda Montgomerie—the name of the American femme fatale—and expurgated all pro-imperial references, which reduced the book to about half its original size. Literature often inadvertently reveals the stories hid between the lines of history. Among the longest expurgated passages was Chapter 6, which discussed the relationship between racism and all European colonialisms in the New World, the British Empire included; it problematized British and American claims to distinct national identities by highlighting their shared past. At one level, Richardson clearly rejected the American model and professed his Britishness; at another, he reveals the irrelevance of both terms when considered from a Native perspective. The Canadian Brothers is simultaneously a testament to the fascination exerted by the U.S., and a reflection on the consequence of European colonialism on the plight of the Natives throughout North America and a critique on the hypocrisy of the British discourse of civility and moral superiority towards the United States. While providing his metropolitan readers with these inconvenient colonial truths embedded in a loyalist narrative, Richardson pushes at the fuzzy margins of multiethnic Britishness, exposing its overlap with whiteness. Oana Godeanu-Kenworthy is a senior lecturer in American Studies and teaches in the Global and Intercultural Studies Department at Miami University, Ohio. She has published in the Journal of European Studies, the Journal of Commonwealth Literature, Early American Studies, and Early American Literature. Her research focuses on transatlantic and hemispheric studies, settler colonial literatures, and the relationship between fiction, film and political ideologies. Fintan O’Toole. “Brexit’s Irish Problem,” The New York Review of Books, September 23, 2017. See Paul Giles Transatlantic Insurrections: British Culture and the Formation of American Literature, 1730-1860 (University of Pennsylvania Press: Philadelphia, 2001). See Daniel Coleman’s discussion of Britishness in White Civility: The Literary Project of English Canada (University of Toronto Press: Toronto, 2008). Oana Godeanu-Kenworthy, “Creole Frontiers: Imperial Ambiguities in the Novels of John Richardson and James Fenimore Cooper,” Early American Literature, 49.3 (2014), 741-770. 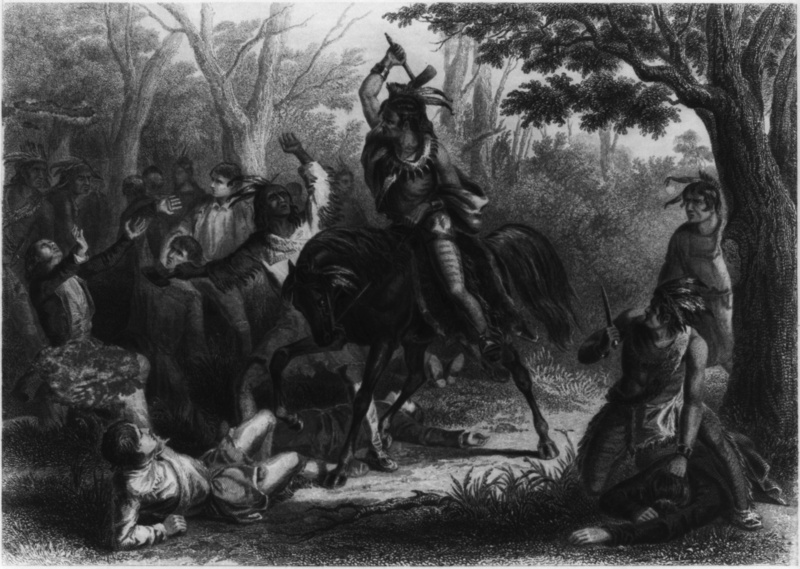 Featured image: “Tecumseh Saving Prisoners,” Virtue & Co., Publishers, c. 1860. Library of Congress, Prints and Photographs Division.